Happy Hour has just gotten a lot happier. For all of the wine lovers out there, your favorite label can now become portable in this insulated wine tumbler. Vino 2 Go is a 10oz Double Wall Insulated Tumbler with a traditional Wine Glass inner liner design. The tumbler is made from BPA Free, shatter proof, clear SAN Acrylic Material and its double wall construction prevents condensation and keeps your beverage at controlled temperature for an extended period of time. Each tumbler includes a pull off lid with a slide open and close function to protect from spills and to keep your beverage free from insects or airborne particles during outdoor casual use. 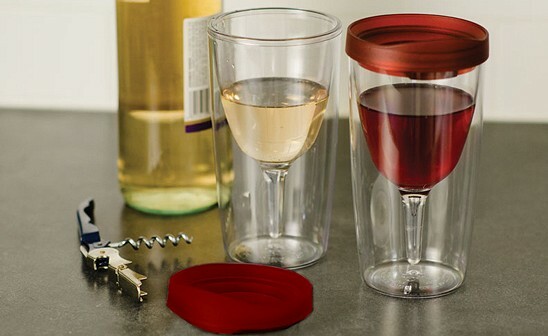 Now you just need to pour yourself a nice glass of wine, sit back and relax wherever you would like with your Vino 2 Go Tumbler. No more worries about spills, stains, insects flying in drink or wine getting warm. Happy Hour has just gotten a lot happier. For all of the wine lovers out there, your favorite label can now become portable in this insulated wine tumbler. Vino 2 Go is a 10oz Double Wall Insulated Tumbler with a traditional Wine Glass inner liner design. The tumbler is made from BPA Free, shatter proof, clear SAN Acrylic Material and its double wall construction prevents condensation and keeps your beverage at controlled temperature for an extended period of time. Each tumbler includes a pull off lid with a slide open and close function to protect from spills and to keep your beverage free from insects or airborne particles during outdoor casual use.